If you want to get on the Nobu boycott-bandwagon, but can’t quite bear it, try stopping by Morimoto in the Meatpacking District. Executive chef Masaharu Morimoto is the former executive chef of Nobu. He also happens to have starred in the Iron Chef television series. The menu at the New York offshoot of the Philadelphia restaurant combines Western ingredients and traditional Japanese cuisine. Their signature dish is the “Duck Duck Duck” which is comprised of a roasted duck leg and a “duck sandwich” made with cucumber and a foie gras infused croissant accented with a red miso sauce and a soft duck egg. 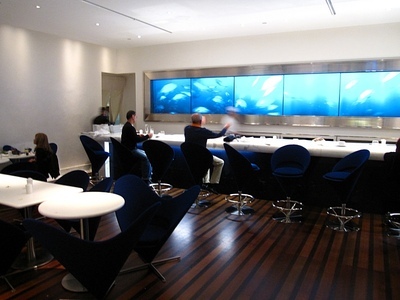 The two-floor restaurant has a sushi bar, 1,500 square foot exposition kitchen, private Omakase bar that accommodates eight and lounge on the lower level. The lounge features a 9-ton sculpture made up of 17,000 Ty Nant spring water bottles. The restaurant was designed by Prizker Prize winning architect Tadao Ando. 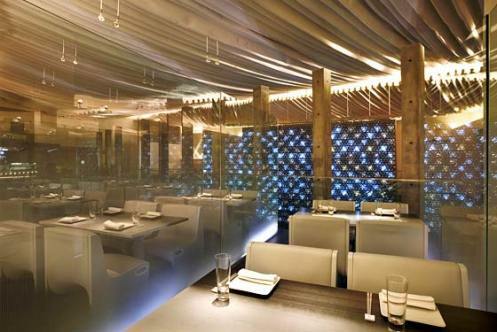 Morimoto is located at 88 10th Avenue, directly underneath the High Line Park.